GENUINA GAMLA STAN - Movitz har lånat sitt namn av en figur som ofta omnämns i Bellmans visor. 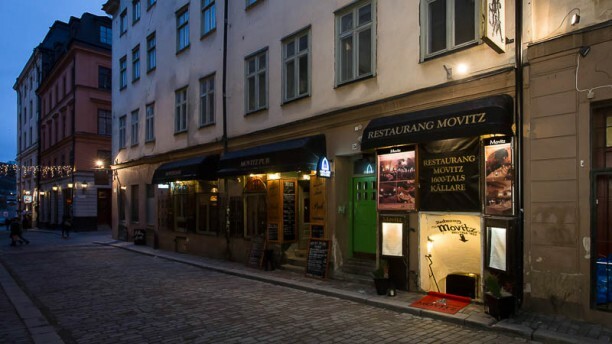 Med sitt läge på Tyska Brinken bland de smala gränderna och huserandes i ett valv från 1600-talet förmedlar restaurangen essensen av det som är Gamla Stan. EGEN PUB - vill du bara fukta strupen och njuta av goda drycker kan du göra det en trappa upp i den populära pubdelen. TRÄFFSÄKER MENY - här finner du allt från svensk husmanskost till franska och italienska rätter, utan att bli överväldigad av alternativ. Du kan också pröva någon av de föreslagna menyerna såsom Hovslagarens eller Borstbindarens. Trevlig restaurang med god mat. The service is great! The food is really good and the area amazing! Really good for celebrations! Fantastic food and great atmosphere with some live music! Really good service! The bruschetta was good, although the shrimp could have been more subtle in taste on their own, the combination of flavours in this dish was truly a culinary work of art. The surf and turf was of high quality, but the sauce could have been better. Don't take me wrong, it was certainly good, but it was not good enough to warrant 5/5 stars in the cullinary arts. The servers wine suggestion however hit home and paired really well with our dishes. The staffs smiles and jokes set the mood for a good evening out with family. Thank you for a lovely time. Nice and picturesque location, tourist orientated (most of the clients were Swedish though); very good kitchen, presentation and cooking; excellent service, our waitress was a charming and nice young Serbian girl that certainly contributed to this high vote. The lobster and the deer meat were just perfect. Good value for money. Unfortunately it was the first time that a waiter asked us to insert the total on the credit card and we didn't understood that they would like to receive a tip. Wonderful find around the corner from our hotel. Historic pub on top floor for pre-dinner drink, another outside entrance leading down into cellar converted into dining area. Excellent, friendly, and knowledgeable service. Nice skagen and wines to start, and flavorful stuffed flounder with 3 sauces for my wife, and meatballs, smashed potatoes, lingonberries and pickles for me. I don't know what is the fuss in these reviews with meatballs, but I received and perfect sized portion, and each ingredient was flavorful. A wonderful last night dinner in Stockholm.